Tanzania Mt. Meru comes from the famed Burka Estate located in the town of Arusha and spans the base of the extinct volcano Mt. Meru. Founded in 1899 by Swiss Austrian settlers, the estate has a long tradition of conservation and is faithful to its ecological roots. The estate helps to maintain the Burka Forest which holds a natural spring which gave Burka its name. Burka means abundance in Swahili. This is considered one of the last and largest indigenous forests in Arusha. Traditionally coffees from this estate are fully washed but this is a natural process coffee. This is only the second year that they have harvested and processed some of their coffee in this way. In picking, they selected the ripest red cherries from specific coffee blocks on the plantation and from there they presort, removing any under or over ripe fruit. The cherries are then stored in sisal bags for a period of 24-36 hours to start the pre-fermentation process. From here the cherries go outside to the drying tables where they lay for 3 days in the sun before being raked and rotated for 35 days in the sun to complete the drying process. The coffee is then gathered and stored for an additional 2 weeks before moving to the dry mill for the last stage of processing. All of this detail and attention to this special process helps develop a very unique flavor profile in the coffee. Just as Burka means “abundance,” Mt. Meru has an abundance of crazy complex flavors. 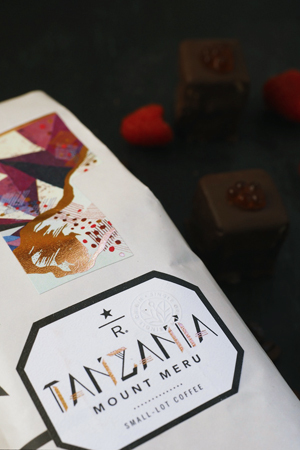 Tanzania Mount Meru was the first coffee from the Starbucks Reserve subscription, that wasn’t previously available at the roastery. 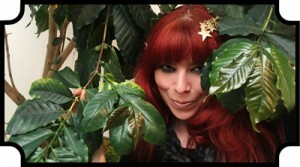 Just from reading the coffee fact sheet, I knew I had to have this coffee. Sun-dried, with ripe berry notes that highlight grape jam and orange marmalade with a dark chocolate finish. Oh yes. One thing I love about the subscription is that the coffee is announced a month out, so that gives me plenty of time to brainstorm pairing ideas. The other is being so close to the roastery, I get to see the action, See the coffee unloaded and roasted, the smells, sometimes the roaster will slip me a freshly roasted bean to try. It is a total attack on all of my senses, and this is when the very best tastings come together.